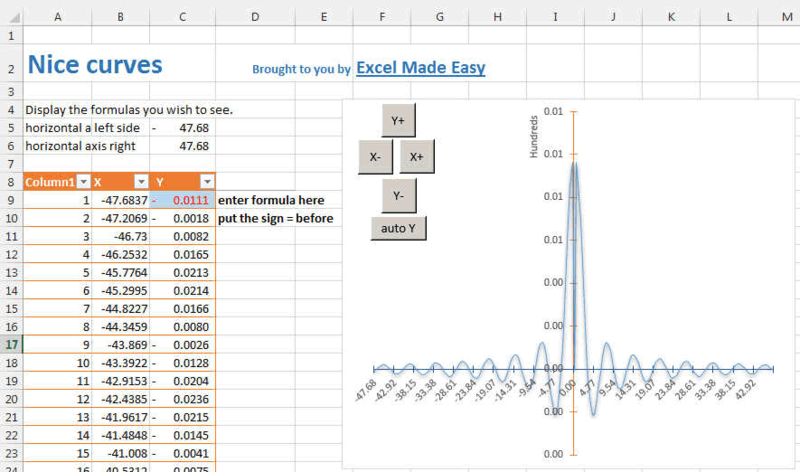 How to Plot a formula in Excel. By ExcelMadeEasy. Draw any mathematical functions. A common question new Excel users ask is "How can I graph an equation?" Excel allows you to draw nice curves of all the formulas you wish. If you are a student or scientist and in order to visualize a process described by an equation, plotting the equation is the easiest. You can see our tutorial in our graph a function page. In this page we show you an example template that will let you graph any functions in Excel. Then you can move it along the axes, zoom in and zoom out of the function You can trace any function you like, linear Function, Exponentials, Trigonometric formulas. Plot any of these functions by selecting them among the ones given in the example. A picture is worth 1000 words. Same for curves and graphs. Try this spreadsheet. The spreadsheet graph template will let you draw curves as follow. There is a version with Macro and one without macro. You might not like macro because of safety reasons but the macro version allows you to use button to change the scales. You can create your owns of course. You can download the spreadsheet template version is here. The Macro allows you to zoom in and zoom out of the function.